Rachel and David used to have a lot of fun together and they were very close. After starting a family and having two kids things changed. Rachel is no longer the confident woman she used to be. She's depressed, doesn't care about her looks any longer and is struggling with the care of two small children. She's on her own as David has withdrawn himself from their family. He works long hours and doesn't support his wife at all. He comes home every night, but isn't really there in spirit. Adam used to be a jovial man who got along with everyone. He's married to the ambitious and critical Julia and they have a family. After a terrible accident their life changed. He was too traumatized to be the person he once was and he's now obsessively compulsive and has nothing to look forward to. Julia escaped this life of doom and gloom and is working and living somewhere else during the week. Adam can do nothing right and this doesn't help him heal. Adam and Rachel used to be best friends when they were students. When Adam sends Rachel a friendship request on Facebook she accepts. They discover that talking to each other is easy. It makes the loneliness and boredom disappear. Because they live far away from each other they keep themselves happy with texts, but for how long can it continue without consequences, what effect does their renewed connection have on their daily life? Because I Was Lonely is a raw emotional story. 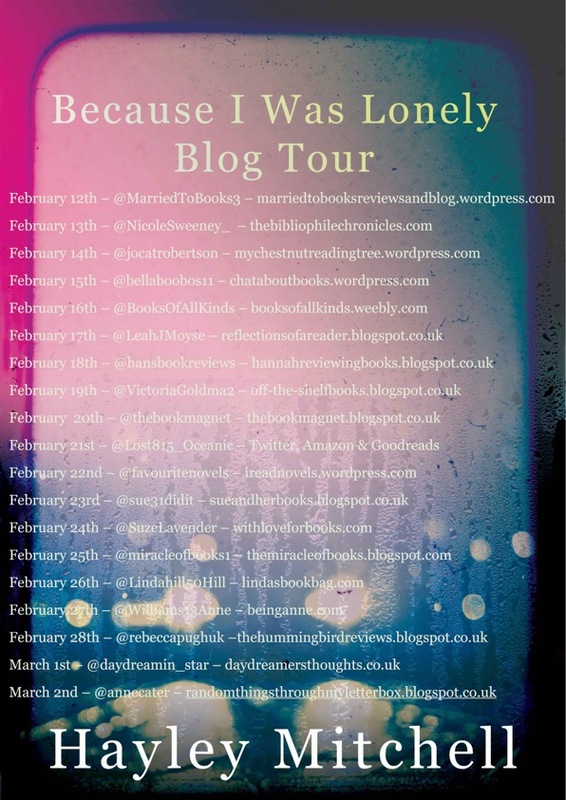 Adam and Rachel are both depressed and Hayley Mitchell writes about their problems in an open and honest way. I was surprised by the amount of detail she gives and sometimes it shocked me, but I also admired the way the information is being presented. Adam and Rachel's text message are versatile, sometimes they are sad and sometimes flirtatious, but from time to time they're mean and jealous too. They have many different emotional layers and that makes the story interesting to read. Adam is a good guy who has lost himself and Rachel is lost inside herself, which makes them have a lot in common. There was already a connection a long time ago, but now it's even deeper because of everything they've been through. Hayley Mitchell's story is realistic, it's something that could easily have happened to two people who are alone and desperate. I loved that she's chosen such a serious and difficult topic for her book and think she's turned it into an excellent story. I learned about a side of Facebook I'd never given any consideration and I loved the originality of it. Hayley Mitchell's writing flows easily. I liked that there are four points of view, which makes it possible to get to know all the main characters through and through. Most of the story focuses on Adam and Rachel, but their spouses, Julia and David, have a voice as well. This gives an objective insight in the situation. Hayley Mitchell doesn't judge, she just tells their story, which is something I applaud. She writes about the black and the white and the many shades of grey in between in an equally fascinating way and there's never any blame and there aren't imposed opinions. To me that felt like being enabled to look through someone's window while being able to hear and see their conversations. I think that's fantastic. 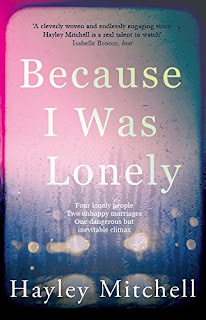 Because I Was Lonely is very special and I absolutely loved this unusual, complex story. If you like to read about real people with realistic problems and are looking for a complex and impressive story to read, Because I Was Lonely is a great choice. I can relate to this story. Would love to read it. Sounds like something we all need to read about. This sounds good. I really love books that are character driven. And the cover is stunning! It sounds like a very sad story and a good read. Great review, it made me interested to learn more about the book! Nothing is ever just black & white, is it? It's all the many shades of grey that make human beings so fascinating. It semis like a little bit of a sad story. I was waiting for your review. And I love it. Sounds like a good book . Thanks for the review . This seems like a book that will really make you think & evaluate life. Sounds enjoyable. Tha NJ you for the review. This sounds like an interesting ng book. I like that you hear all 4 characters voice. The incorporation of Facebook/social media sounds interesting. I can imagine academics in the future reading the novel to study the Facebook era.